Createspace Independent Publishing Platform, 9781543249255, 330pp. A Deadly Recollection is Hanrahan's second entry into the fictional world of murder, mystery, suspense and riveting courtroom drama. Bill Coine, Boston's brand new private eye in Downsized, is featured in his last case before retirement as a Massachusetts State Police Detective Lieutenant. As in "Downsized," the pages keep turning right up to the breathtaking and unexpected ending. Here is the synopsis of the story: In less than seventy-eight hours a harmless Boston bookie, Harold "Smokey" Goldman, is brutally murdered, a Brooklyn hit man, Joe Buscada, is found dead in an open grave in the Quincy Memorial Cemetery and Dan Riley, a prominent Boston trial attorney, is shot on the front steps of the John Adams Courthouse. Are these events related? And if so, who is calling the shots? Is it the mob? Or is it a vicious vendetta stemming from Riley's distant past in Brooklyn? Enter Detective Lieutenant Bill Coine, a relentless crime solver, who must contend with local politics and an international assassin known as the Scope. Coine, with the aid of the FBI, solves the case. But does it stop the killing? Clever twists and turns and the obligatory surprise ending await the reader. Hanrahan's second novel, a fascinating prequel, reinforces his reputation as a gifted storyteller. A street smart Brooklyn native, a former captain in a combat branch of the US Army and an experienced Boston Trial Attorney, Hanrahan puts this rich experience to good use in A Deadly Recollection. Although plot and cast are strictly a product of his imagination, Hanrahan breathes life into his characters. 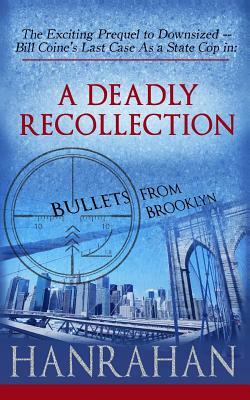 A Deadly Recollection is a must read for the true lover of the suspense/courtroom drama genre.